After beating Denver 23-22 in last season’s highest scoring game of the season, the Machine’s 2015 home opener at Selby Stadium matchup proved to be just as exciting. A combined three goals scored with under a minute to play in the game made for an exciting finish as Denver edged out the Machine 14-13. Jeremy Sieverts scored four goals for the Outlaws, and Mike Bocklet netted the game-winner that came with 1.2 seconds to go in the game. Peter Baum led the way for the Machine with his second straight hat trick, surpassing the 40 career goal mark. Denver came out hot with attackman Bocklet scoring the first goal of the game just a minute into the game. However, after tallying five points in the season opener at New York, Baum picked up where he had left off last week in rattling in the Machine’s first goal with 13:37 to play in the first. The rest of the first half continued to be a back-and-forth battle with Denver taking the advantage 4-3 after fifteen minutes of play. Baum, who has scored in every MLL game he has ever played in, scored career-goal number 40 with 42 seconds to play in the first. Marcus Holman, Kyle Harrison and Zack Palmer rounded out the first half scoring for the Machine. For Palmer, it was his first career goal. The second-half opened with Denver regaining the lead after scoring four quick goals, making the score 10-8 just seven minutes into the third quarter. However, the Machine continued to battle back. After being held scoreless for over fifteen minutes of game time, Tom Schreiber scored back-to-back goals to move Ohio to within one, making it 12-11. With 1:15 to play in the game, Holman rung in his second goal of the game to tie it up before Denver reciprocated with a goal of their own. Machine defenseman Brian Farrell scooped up a groundball and ran it the length of the field and finishing with a bounce-in goal to tie the game at 13. With overtime looming, Bocklet was able to put the ball in the net one last time before the final buzzer sounded to steal the win for Denver. 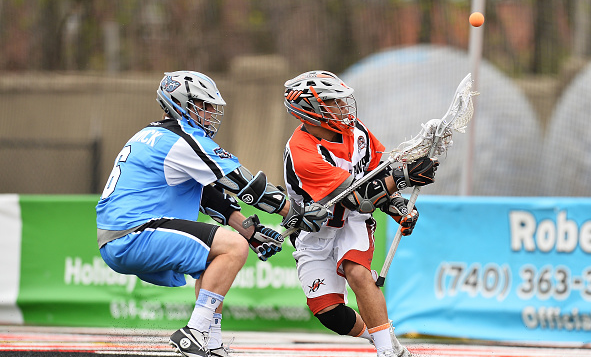 The Machine returns to action on May 3 when the team travels to Chesapeake to face the Bayhawks. The team returns home on May 16 for a showdown with the Charlotte Hounds.